Over the last few months we have reflected on how it’s possible to shift culture in a range of different settings. This month we want to take a look at shifting culture in our own street. Anything that can introduce the values of healthy relationship and authentic community will bring health and healing and help to restore our community to the state that was our loving God’s design. People who have lived in our community for more than 10 years say that one of the big differences they have seen in that time is a significant decrease in young people on the streets after school hours. There has been a shift as families and youngsters keep themselves to themselves, often isolated within their own homes, sitting in bedrooms on the play station or xbox. Isolation has many negative consequences to our physical and mental health as individuals and as communities. Anything that can introduce the values of healthy relationship and authentic community will bring health and healing and help to restore our community to the state that was our loving God’s design. I recall 2012 was a huge year for building community across our nation. We had the Olympics preceded by both the Queens’ Jubilee and the Big Lunch. 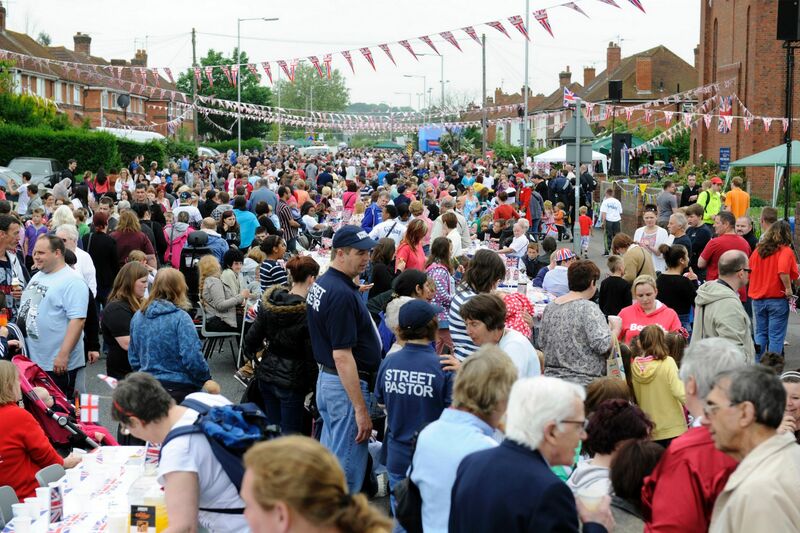 In our community here in South Reading, the main road, Northumberland Avenue was closed off and, with St Agnes church as the pivot point, the road was filled with tables and chairs. 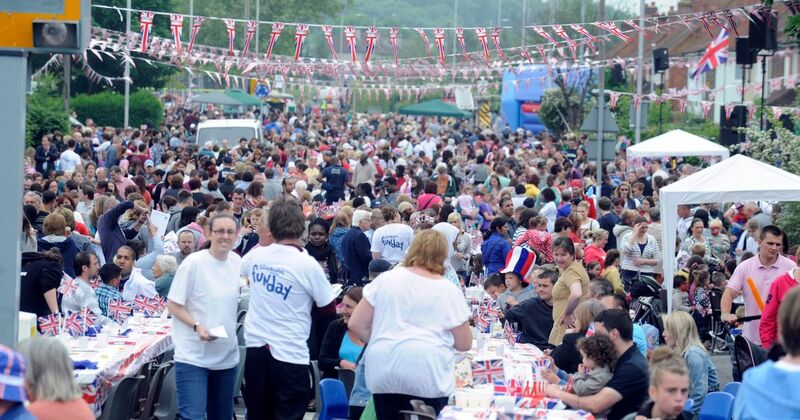 5000 people were part of that moment, it was something that the community did together – everyone helping with food and drinks, the local fire brigade came and helped put up the high bunting and took an amazing areal picture of the event. The party is a huge highlight in the community’s memory to this day. It was one of the largest street parties in the country that year but they don’t have to be that big! 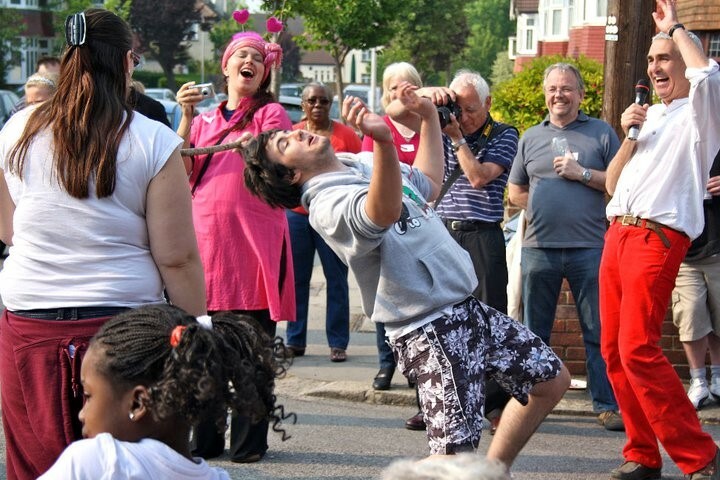 Last year a friend of ours here in South Reading decided to do a street party in the cul de sac where she lives. Each household was invited, there was food and music (not too loud so people could have conversations! ), and a few fun activities to get people meeting and speaking with each other. It was a low key, fun event, and from it neighbours have since been connecting more and relationships are being built. Another friend of ours, Jenny Woods, lived for several years in the same house in Croydon, Surrey. Over that time she established a rhythm of annual street parties which led to other events that the residents put on to celebrate various life events as well as Christmas and other movements. In her time there, Jenny saw the neighbourhood transformed from a street of isolated households, to a street of neighbours who knew and cared for each other. She didn’t do it single handed, she invited a handful of neighbours who together with her planned and organised and gathered the rest of the street for each event. So not only each event but the process leading up to the event, helped to build healthy relationship and a sense of community in the street. I also know of a street near where I live which, in the warmer months, closes to traffic one Saturday a month for street cricket and other games so families can connect and kids can safely play. Others might do a street Bar B Que, my friend Jenny’s neighbours put on an outdoor movie night, some do simple coffee mornings; there are as many ways of gathering the neighbours as there are people willing to give it a go! 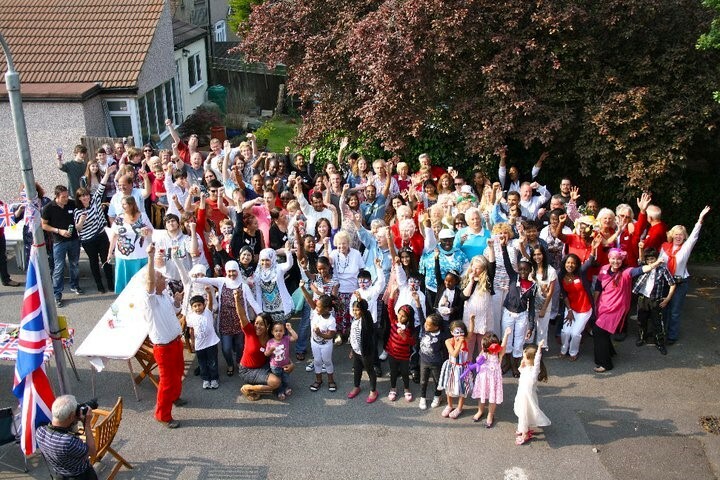 The point is that gathering regularly (even if it’s just once a year), in a spirit of friendship, inclusivity and care, can dramatically change the culture a street, helping to move people from isolation to authentic connection thereby building richer and happier lives. So, why not give it a go this year? In her time there, Jenny saw the neighbourhood transformed from a street of isolated households, to a street of neighbours who knew and cared for each other.